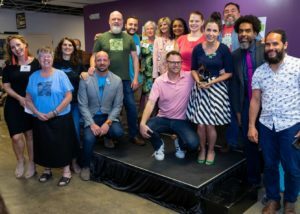 Arts Alive Awards is June 11, 2019! WHO WILL YOU NOMINATE? MAKE RESERVATIONS! NEW THIS YEAR – ARTS ALIVE AFTER PARTY! Porchrokr Festival Committee which won the 2018 Arts Alive Award. The Arts Alive Awards event was created in 2001 to recognize gifted artists, art educators and change-making advocates with an inspiring celebration of achievement. The Arts Alive Awards community nomination process has always been a part of the event, and you’ll see many familiar names of artists, dancers, musicians, leaders and advocates who have sustained excellence in their fields and gone on to represent our community on the world stage. Click here for previous winners. Tuesday, June 11, 6-8 p.m.
$65 Single Reservation. CLICK HERE. All proceeds benefit the Summit Artspace galleries which showcase local art and artists. Tuesday, June 11, 8 p.m.
$20 Single Reservation. CLICK HERE. Get ready to join the art community at the After Party for mingling, music, a cash bar and fun food truck fare that you can purchase. Artist Call: Share Your Artistry with Arts Alive! *dEADLINE TO NOMINATE IS mAY 1, 2019. ** deadline to make reservations is june 5, 2019. Diana L. Selzer is a Vice President and Relationship Manager with Wells Fargo Middle Market Banking Group. Diana joined Wells Fargo in 2017. Her banking career started in 2010 at Huntington National Bank in Akron. Growing up a Girl Scout and obtaining her Gold Award, Diana was taught from a young age the importance of giving back to the community, being a sister to every Girl Scout and making the world a better place. Being involved in the community has always been part of who she is; but she doesn’t just serve in the community, she leads the pack. 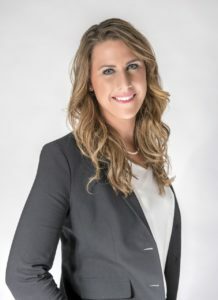 Her passion for maximizing her strengths is reflected through a variety of leadership roles with the Akron Area YMCA Board of Trustees, Akron Children’s Hospital, Girl Scouts of Northeast Ohio, Women’s Endowment Fund – a fund of Akron Community Foundation, the Greater Akron Chamber, Summit County Progress and Economic Development Board and Women’s Leadership Conference of Northeast Ohio. Ace has over 14 years of experience working in the nonprofit sector and in 2013 started an LLC called the Self Advancement Center (SAC). At the SAC, Ace teaches job readiness training, soft skills and interviewing techniques. He also hosts a weekly radio show called “Center Talks” a partnership with WAKR 1590am and the Akron Urban League. 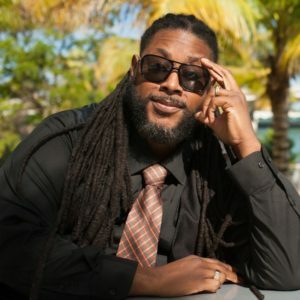 On the “Pod Bean” online platform Ace produces local podcasters while hosting a weekly podcast of his own called “ReWine”. Ace currently serves as the Community Manager for Akron BMe Community, a non-profit organization located in Akron, Ohio. BMe Community focuses on positive images of black men while showing that they are assets in building better communities. Ace also works as the Program Manager for OPEN M’s Community Works Akron program. Mark your calendar! Want to be on the invitation list? Email us at kamelia@summitartspace.org. Dan Wilson providing a few jazz scores.